One of the more unusual commissions I had recently was to copy out two thirteenth-century charters on to vellum panels, and write the translations underneath. The charters granted the rights to a weekly market and an annual two-day fair to the district of Brentwood (Bois Arsus, Brendewode, and Burntwood); one was dated 1227 and the other 1252. 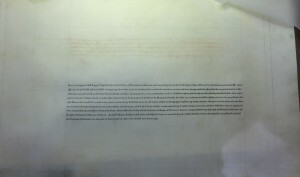 This may seem straightforward – until you see the actual charters, as one of them on the right. The earlier one of 1227 had a great many contractions, and I was most grateful to Tessa Webber at Cambridge University for very kindly transcribing it for me, so at least I was able to try to decipher whether a Latin word started with ‘min…’ or ‘uni…’ or ‘niu…’ etc! 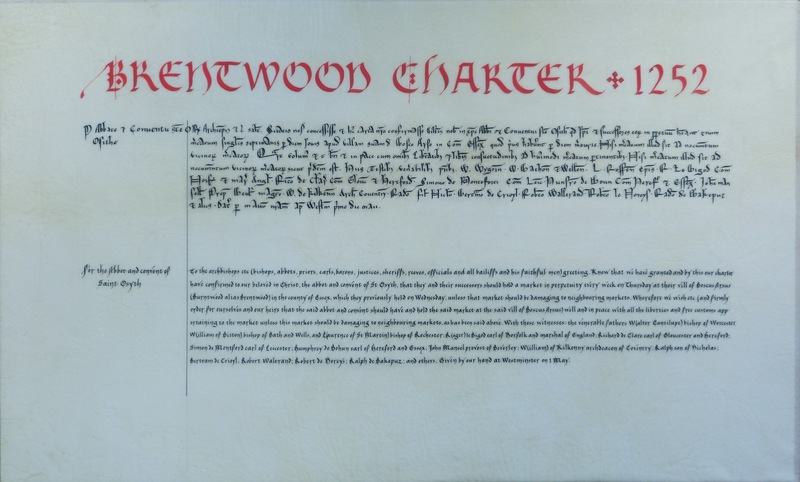 The later charter of 1252 was slightly clearer, but it still meant that I had to resort to my scant knowledge of mediæval Latin on occasion. 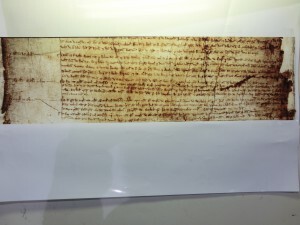 The width of the panels was determined by the charters themselves, and I felt that there should be a consistency between the two panels in terms of size, shape and layout, even though this may mean larger gaps between the copied Latin and the English translation (as in the first panel above). 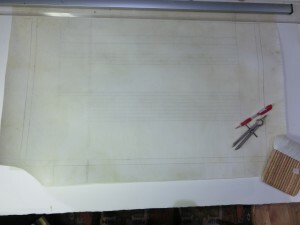 I was able to get some wonderfully marked skin from Cowleys and cut pieces to size before stretching them. 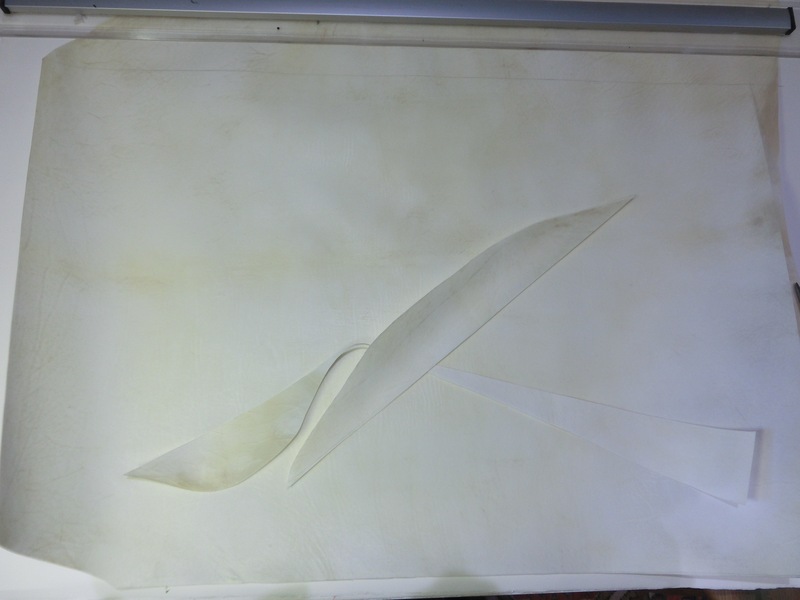 The excess was ideal to use for determining how much preparation was required for each skin. 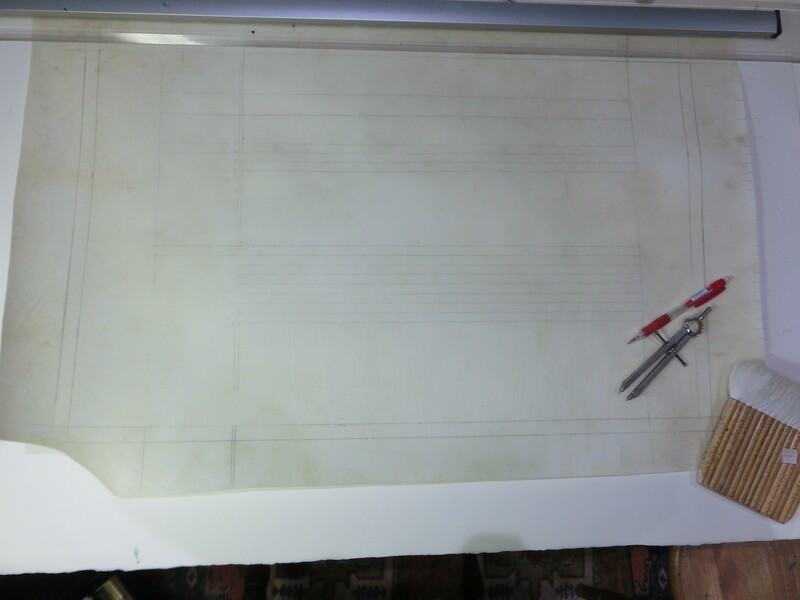 Then it was time to rule the lines with a 4H pencil and the sliding rule of my sloping board. Distances between the lines were marked with dividers. I started with the translations. 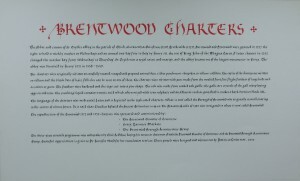 The two charters were in totally different hands, albeit being only twenty-five years apart, but I thought it important that the translations should be in the same writing style, trying to marry together the hands on the two charters rather than choosing any particular calligraphic style. 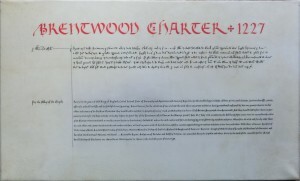 Also, the writing needed to be legible for those who wished to know what the Latin in the charter meant. This is a close-up of my first efforts. 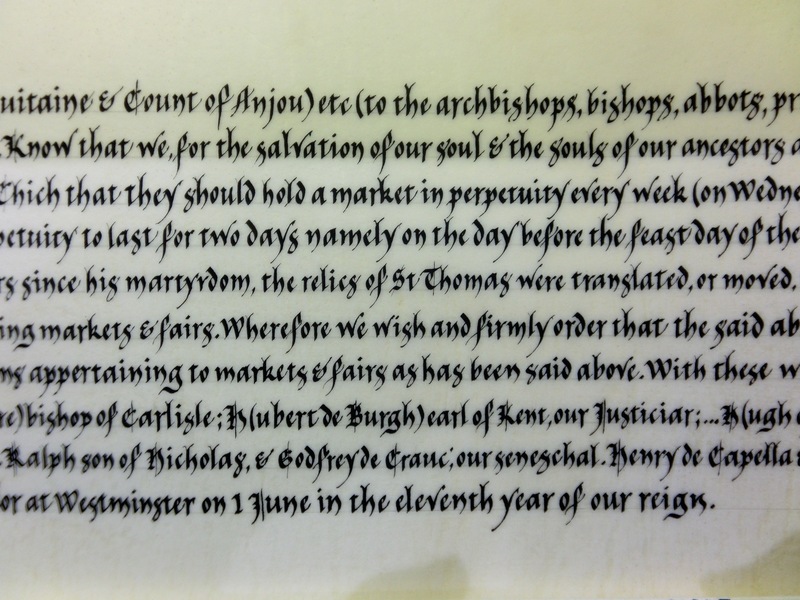 I thought the final effect too heavy and dominant and so chose a smaller nib which seemed to balance the writing in the charters better. 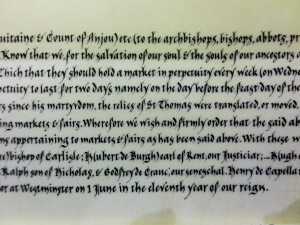 The writing in that period of time was Gothic, but Gothic Black Letter majuscules are so difficult to read, so again I devised a style, this time based on Gothic Black Letter and Gothic Cursive. I used a five-diamond cross to separate the title from the date, as this looked more in keeping than the simple dash. 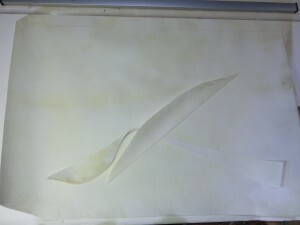 The titles were written in vermilion. 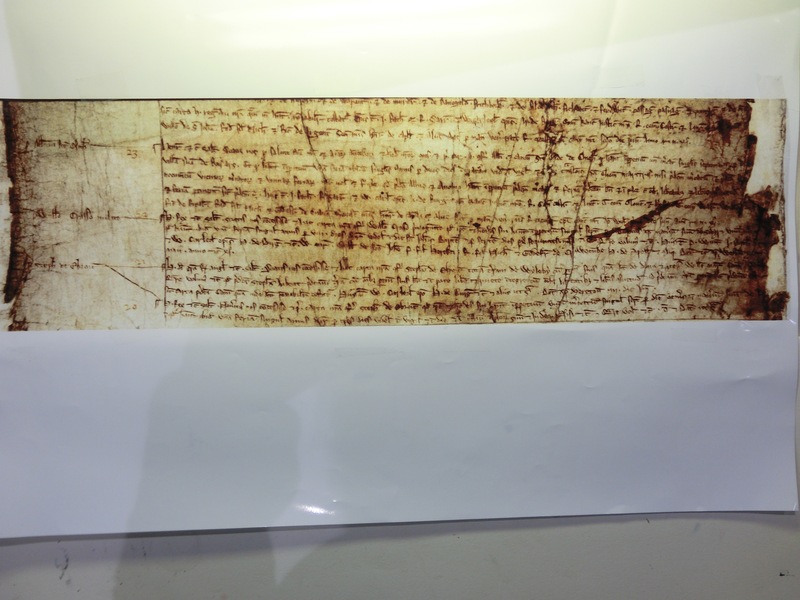 The third panel, on paper the same size as the stretched vellum, explained about the charters, what they were written on and the pen and ink used originally. 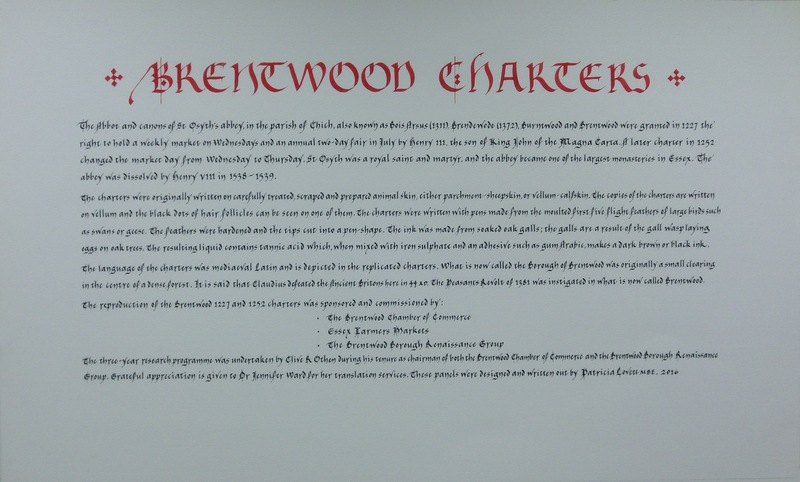 The cost of the charters was met entirely by sponsors who commissioned the panels (The Brentwood Borough Renaissance Group, Brentwood Chamber of Commerce and the Essex Farmers’ Markets Ltd) and Clive Othen, Chair of the Brentwood Chamber of Commerce and the Brentwood Borough Renaissance Group, was the driving force behind this project. Dr Jennifer Ward translated them. Clive and Elaine Richardson from the Borough were some of the best clients I have worked with and I hope the panels prove interesting to those who live in Brentwood and others who visit. 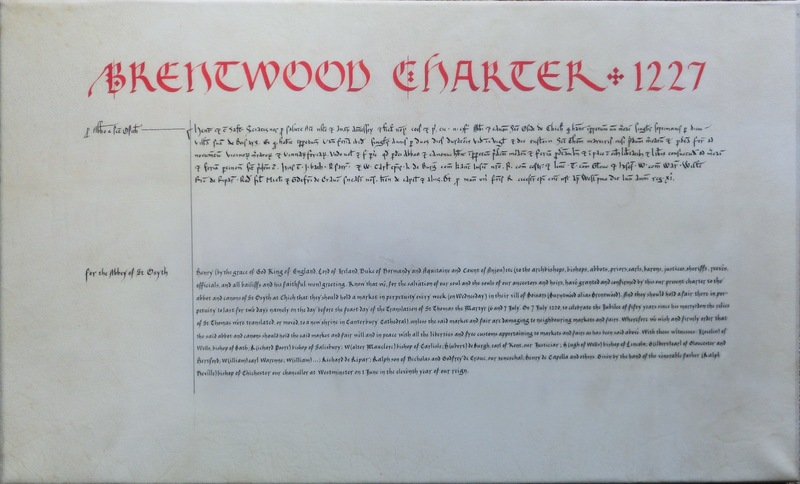 This entry was posted in Blog, Calligraphy and lettering, Interesting stuff, lettering and tagged Brentwood, calligraphy, charters, thirteenth century, vellum on 15 September 2016 by Patricia.